The outstanding Leaving Certificate 2012 results of five Marist students, Conor McMenamin, Jonathan Lynn, Conor Brosnan, Donal Mischo and Alan Dowdall were recognised at ceremonies in Trinity College, University College Dublin and N.U.I. Maynooth recently when the students were awarded entrance scholarships. 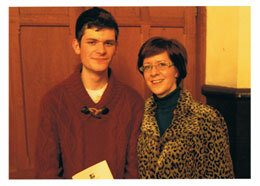 Two of the group, Conor McMenamin and Jonathan Lynn were also the recipients of the Naughton Foundation scholarships. Founded by local businessman, Martin Naughton, of Glen Dimplex, the Naughton Institute awards twenty scholarships to Third Level Engineering, Science or Technology students each year. Jonathan received First Prize of €4000 per year and Conor, Second Prize of €2000 per year for the duration of their degree programmes. Since, both Co. Louth winners came from St. Mary’s College, the school received €2000 to spend on science equipment. St. Mary’s College are extremely proud of the five model students, their exemplary performance in their Leaving Cert and subsequent awarding of their scholarships. Their examination results, a just reward for their work ethic, dedication and commitment throughout their time in the Marist. We congratulate them and wish them well in their studies at Third Level. St. Mary's College students, Jonathan Lynn and Alan Dowdall pictured at a ceremony at Trinity College, Dublin where they were both awarded entrance scholarships in recognition of their outstanding Leaving Certificate results. 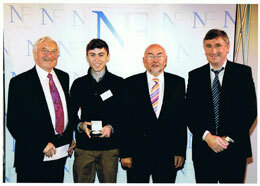 Martin Naughton (The Naughton Foundation), Jonathan Lynn, Ruairi Quinn (Minister for Education & Skills) and Ger Lyons (Chemistry teacher, St. Mary's College). 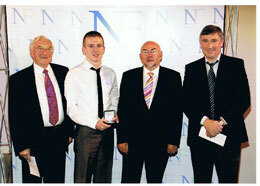 Martin Naughton (The Naughton Foundation), Conor McMenamin, Ruairi Quinn (Minister for Education & Skills) and Ger Lyons (Chemistry Teacher, St. Mary's College).